Macadamia nut butter is made from macadamia nut oil, which is rich in palmitoleic fatty acid, tocopherol (vitamin E), squalene, and phytosterols. These natural components make macadamia nut butter an excellent choice for keeping the skin moisturized and looking smooth and soft. A pale oil obtained from almonds (Prunus amygdalus dulcis). Rich in oleic and linoleic triglycerides, sweet almond oil is an excellent skin conditioning agent that helps keep your skin hydrated and looking smooth and soft. Almond oil helps protect the surface of the skin, while conditioning the skin and promoting a clear, young-looking complexion. Almond oil is also a great moisturizer that is appropriate for all skin types, but is especially soothing on dry or irritated skin. What Makes Motives® Color Perfection Quads Unique? The possibilities for creating the look you love are endless with Motives Color Perfection Quads. Contour, highlight and conceal with each all-in-one quad, containing four shades that can be mixed to achieve a foundation color matching your skin tone. Motives Color Perfection Quads contain vitamins and oils to moisturize and condition skin throughout the day, making it ideal for all skin types. Achieve color perfection with Motives Color Perfection Quads today! Why should I use Motives Color Perfection Quads? Motives Color Perfection Quads are full coverage foundations that allow you to contour, highlight and conceal without having to buy multiple products – which will save you time and money! How much coverage do Motives Color Perfection Quads provide? By allowing you to customize your foundation, Motives Color Perfection Quads has buildable coverage from medium to full. 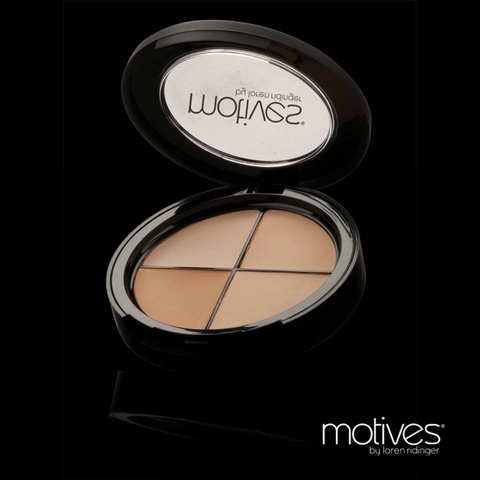 Is Motives Color Perfection Quads ideal for all skin tones and skin types? Yes, each quad contains four colors that can be mixed to achieve a foundation color matching your skin tone. Motives Color Perfection Quads contain vitamins and oils to moisturize and condition skin throughout the day, making it ideal for all skin types. Yes, this product is free of parabens, fragrance, oil and dyes, which are known skin irritants.